The Salford booth is located on lots 805 and 1112 at the Farm Progress show site in Decatur IL. 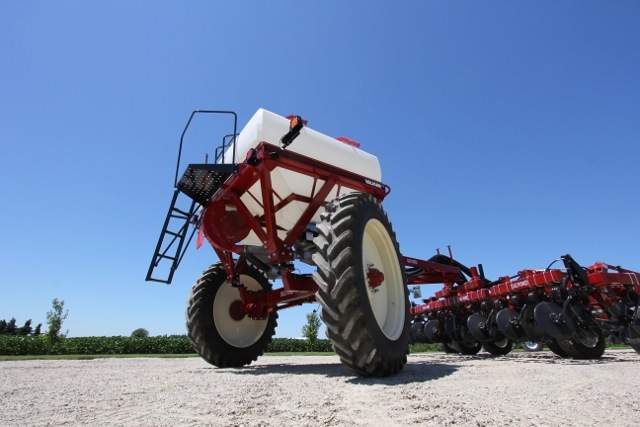 The PathFinder is equipped with a steerable axle that can be adjusted from 120 inches up to 160 inches, a key feature that Baker’s team developed to meet row crop and controlled traffic farming requirements. “The PathFinder’s long hitch magnifies the steering effect and allows the Salford cart to track more accurately than comparable carts,” said Baker. The cart’s standard 380/90R46 row crop tires and high clearance axle design also allow the machine to enter the field for later season applications. The PathFinder comes with a universal, double ball hitch, so that the cart can be coupled with virtually any leading tool bar, strip-till or tillage implement or planting equipment. This versatility is meant to improve the delivery of fertilizers at the “right time” and the “right place” in convention with the 4R nutrient management strategy. “The 4R nutrient management goal is to increase the efficiency of fertilizer application for more cost effective fertilizer use with less environmental impact,” said Baker. Salford’s Valmar product line of pneumatic application equipment can be used on the PathFinder for dry product application. The Valmar ST-6 and ST-8, with the “ST” being short for strip-till, are highly accurate dry product metering systems that can be used for seed or fertilizer. The ST models can be plumbed to feed up to 36, 30 inch rows with optional splitter systems. The ST-8 model, with eight tons (250 cubic feet) of capacity, can be equipped for two-product blending, with accurate metering on each product ahead of the air stream for superior product mixing. Salford Group, with facilities in Iowa, Georgia, Ontario, Manitoba, and Russia, is a global leader in the manufacturing of tillage, seeding, and precision nutrient application equipment. The company dedicates its ongoing innovation efforts to precision, durability, versatility in the field, improving the economics of farming for producers worldwide.